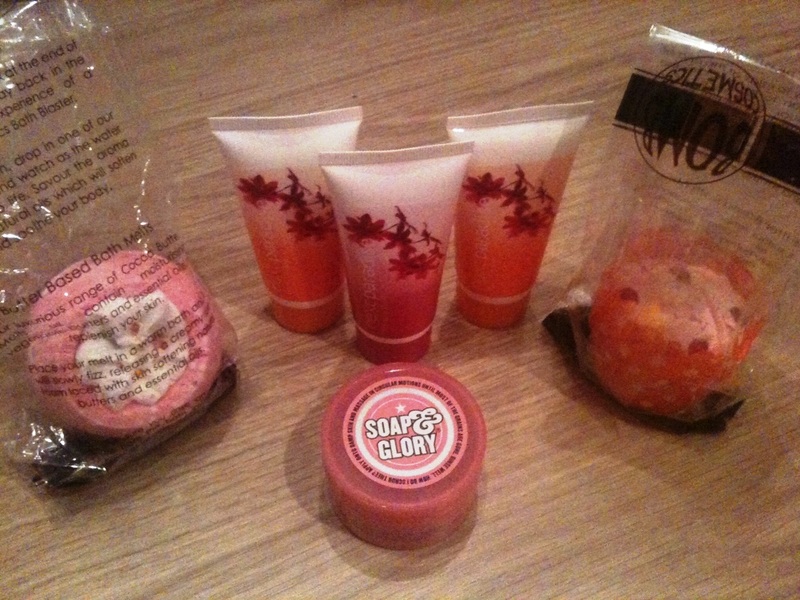 Blog GIVEAWAY, Challenge - Day 2, Wee update!! OOTD - Would you rock white tights?? 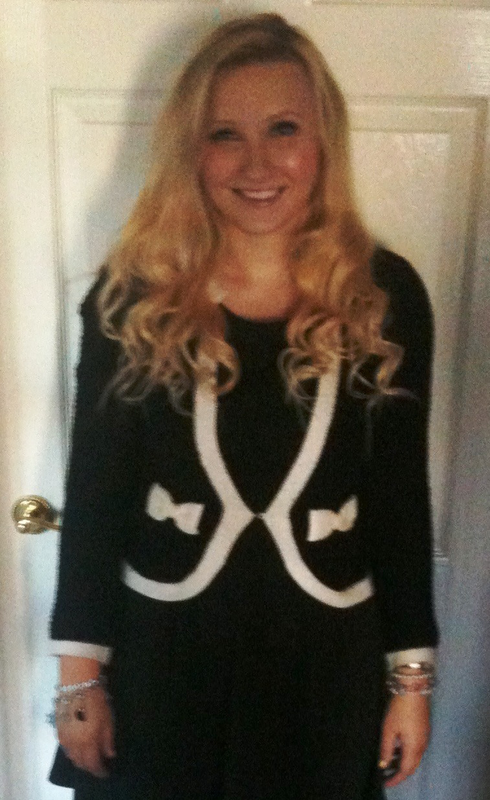 Graduate Fair OOTD - APOLOGIES for the photos!!! So, did my socks stay up?? Wee quicky for my sticky problem! Oops, there goes my budget..! Hello!! I feel like it's been ages since I've blogged, even though it was only really the weekend. I had an awesome time in London, it was great to see my friend again! I didn't get a chance to take any photos specifically for here (my friends don't know about my blog) so apologies for the 'Facebook' photos!! I really need to hire someone to start taking photos for me so I don't look like a complete idiot. Love me a bit of Primark. Also love these socks, seem to be wearing them a lot!! So after the flight it was an hour's bus journey to where my friend lives, so we got to hers about eleven thirty at night. A few drinks then bed! She lives really central so it was awesome. I'm second from the right, and Mandy (who we're visiting) is furthest right. Oooh, so excited! Reached over 50 followers on my two week anniversary, thank you guys!! A photo of Max and Dana as kittens to give a big clue lol! The last thing on the agenda today is me being SUPER excited because I started my blog exactly two weeks ago today and I'm nearly at 50 followers! So to celebrate, once I reach 50, I will do a little blog giveaway. Obviously this is my first time doing this so I'm exciiiited! Thanks for all your support guys!! Day 30 – Your favorite song. I can't wait to find out more about you guys, and to share some info about myself! 2. I spent three months in California and one month travelling two summers ago and it was the best experience of my life. 3. I don't like chips, Chinese food, Indian food or any form of spicy food. 4. My life's passion is animals! I would love to own my own animal shelter. 5. 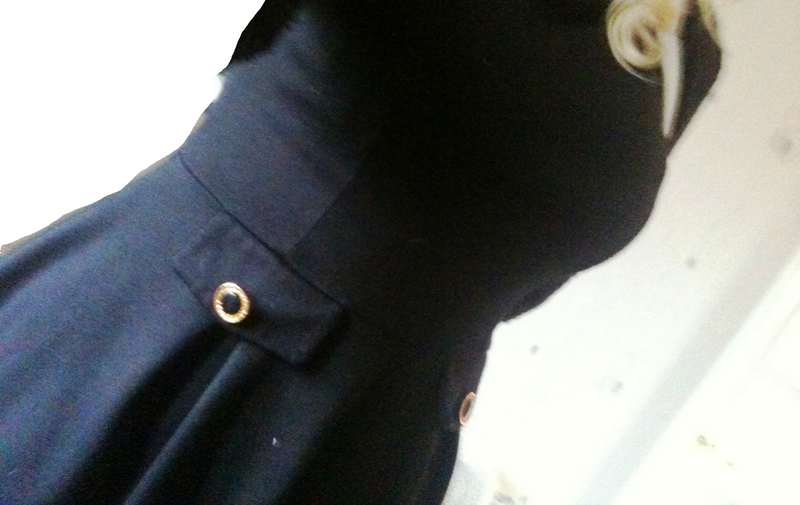 I don't think I've ever bought an item of clothes from Topshop. 6. I will have been with my boyfriend Scott for seven years in February. We have a huge height difference; he's 6"4 and I'm 5"2. 7. I am a qualified pharmaceutical dispenser and am the one all my friends turn to for questions about medicine and illness! I have quite a few medical problems myself and take at least six tablets a day. 8. I'm pretty obssessed with Zumba right now, I can go to six classes a week! 9. I love sooo many different kinds of music, from Lifehouse to Eminem to Britney to Chase & Status. I also love songs from musicals. 10. I am a total and utter bookworm - I read like crazy and recently got a Kindle which barely leaves my side. 11. I don't want to grow up, but when I do my dream is to make a difference. I just don't know how yet. 12. People sometimes judge me differently on how I look, but I'm actually pretty smart. I have eight 1's at Standard Grade, five A's at Higher level and a First Class Honours Degree. It's pretty much the best you can get. 13. I live near Glasgow in Scotland, but one day I'm emigrating! 14. I am quite claustrophobic, am terrified of spiders and flying!! 15. I am stupidly excited over my blog and am loving the new community I'm joining! Ta da! Hope that wasn't too boring and you learnt a bit about me. Make sure you let me know if you're doing this too! False Eyelashes: The Cheat's Way to Perfect Application! 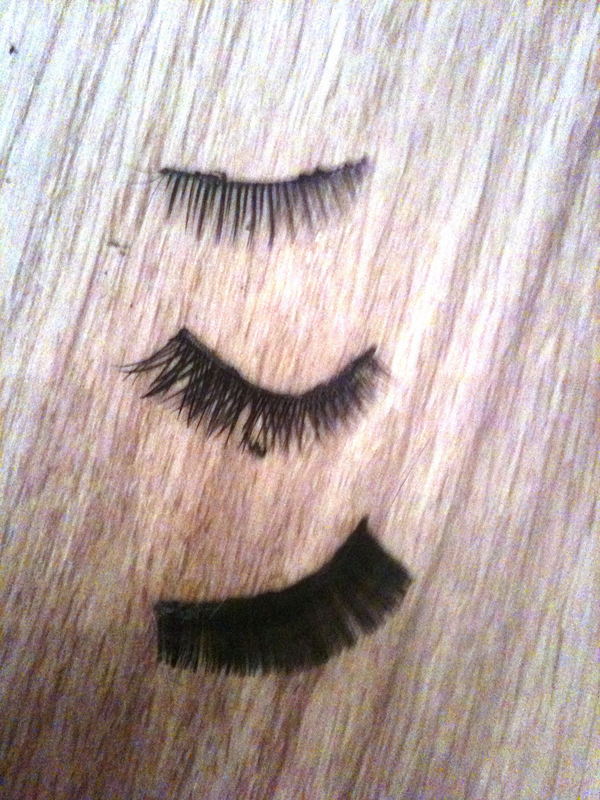 Firstly, there are obviously a wide variety of eyelashes available. Because I wear them a lot, I tend to go for cheaper, 'throw-away' ones. I bought a set of ten off eBay recently for £1 lol. As you can imagine, they're not fantastic quality, but they do the job and hey - I'm on a serious budget right now. They look a bit ratty because they're well loved lol! So the top one is the one I'm going to apply to show you the 'everyday' look with falsies, the middle I'm going to apply to my other eye for more of a dramatic look. I'm not actually a huge fan of the bottom lashes, think I wore them maybe once, they're just too much for me. I like them to look quite natural. 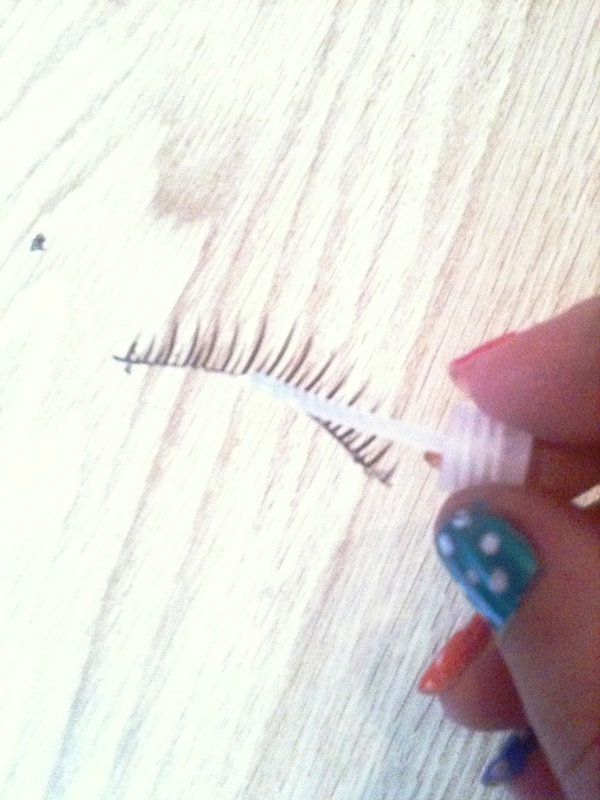 I'm going to apply the day eyelashes the traditional way. 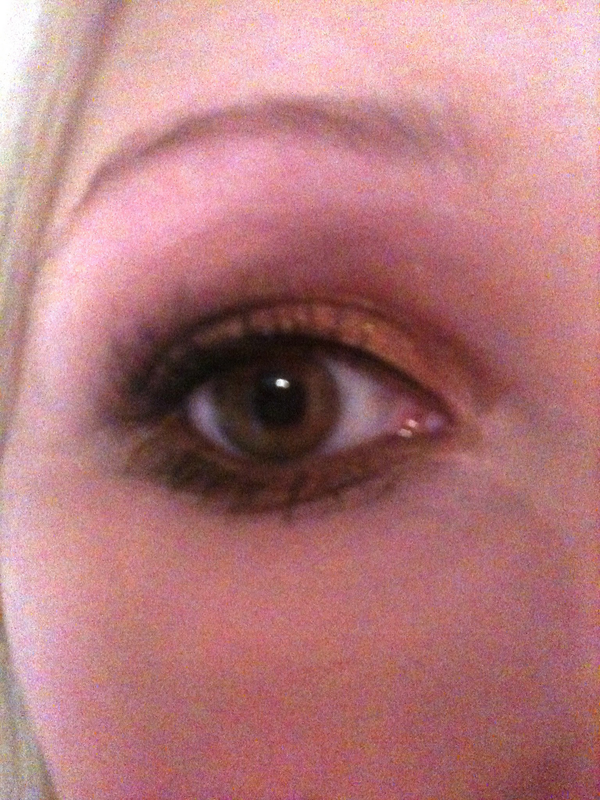 So first, I apply all my eye make up as normal. Usually it's a good idea to do a slick of eyeliner as this will help the eyelashes to blend in. So, Step One. Apply your chosen glue to the eyelashes and leave for 20-30 seconds until it becomes tacky. Step Two. I then carefully hold the lashes and position them right above/behind my real eyelashes so it's they're almost on the lashline. Some people use tweezers for this. Step Three. Gently lower the falsies so they are sitting on the lashline right behind your real eyelashes. When they're in position, I gently press down on either corner for about ten seconds and then run your finger along the whole lash line, pressing down to make sure it's all secure. If you're not happy with the first time, just peel them off the re-position, the glue should still be sticky enough to let you have one more try! Step Four (optional). Use eyelash curlers to help blend your real and fake eyelashes, and another coat of mascara if you like. So that's the day look and the traditional application. Now I'm gonna show you the night look using the CHEAT'S WAY! 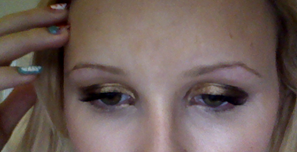 Here's my night time make up without falsies obv. Step One. Whip out the magic tool (not as exciting as it sounds)!! This is my actual lifesaver. It's a serious beauty essential now. I got it from ELF (obv) and it's bascally a false eyelash applicator. It's so easy to use and basically gives perfect results in about thirty seconds lol. So here's how to use it. Step Two. 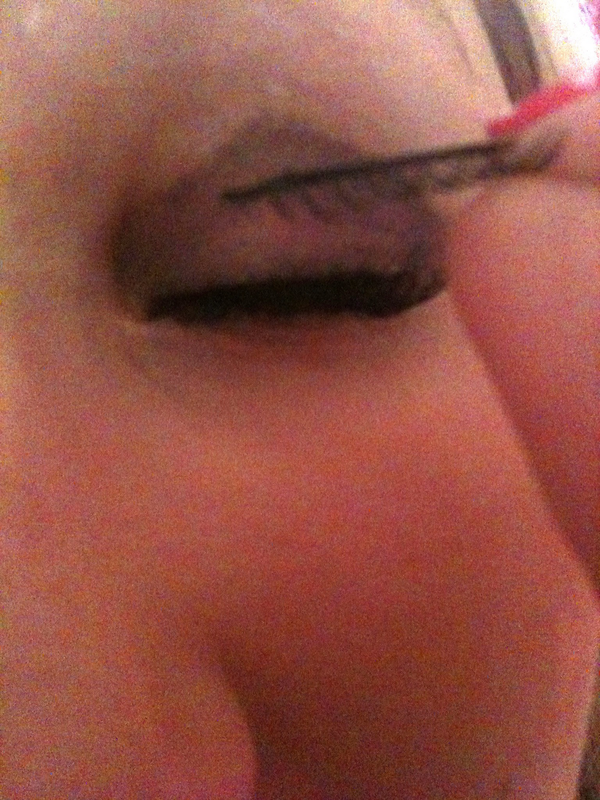 Put false eyelashes in applicator (just by squeezing one end to open it up and sliding them in). Make sure they're the right way up. 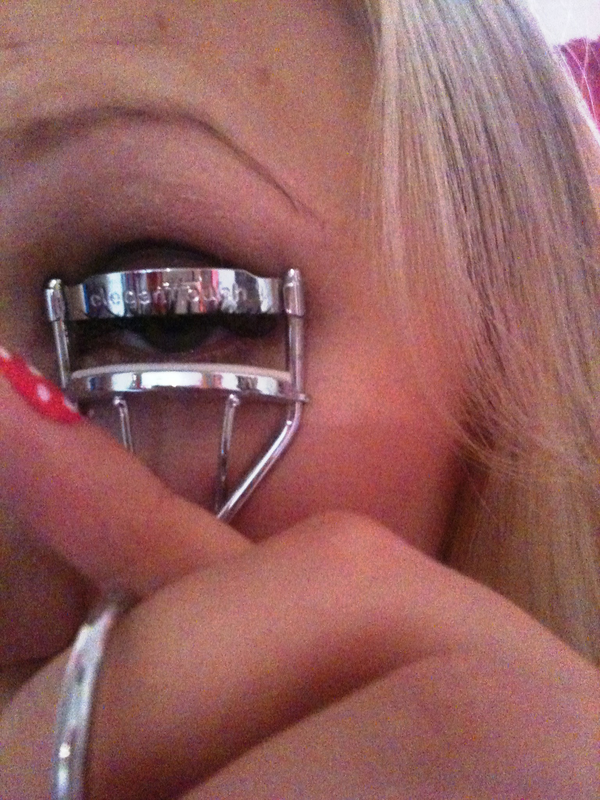 Apply glue to the visible lash line. 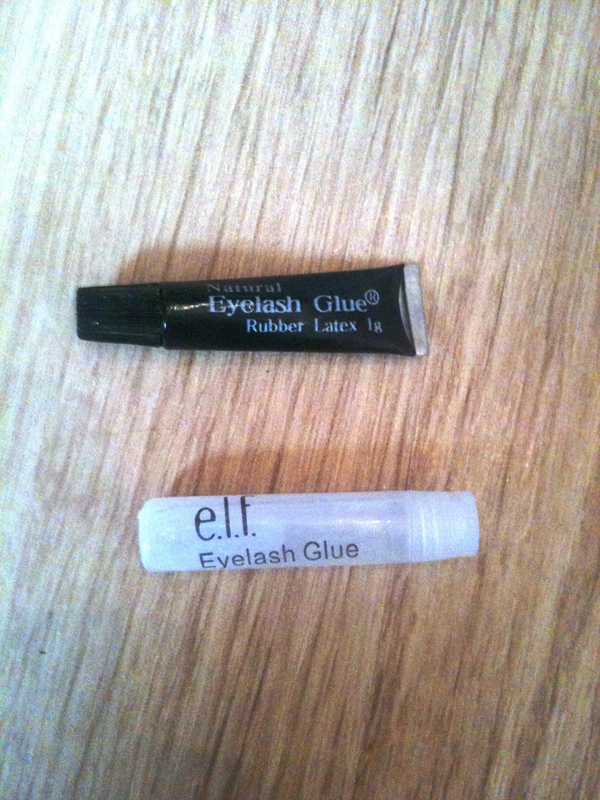 I'm using the black glue because it acts as like an extra eyeliner for night eyes. Remember let it get tacky for about 20-30 seconds. Step Three. 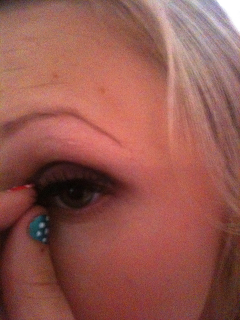 Basically just line it up so the falsies are touching the eyelid lashline, and hold it there for about ten seconds. 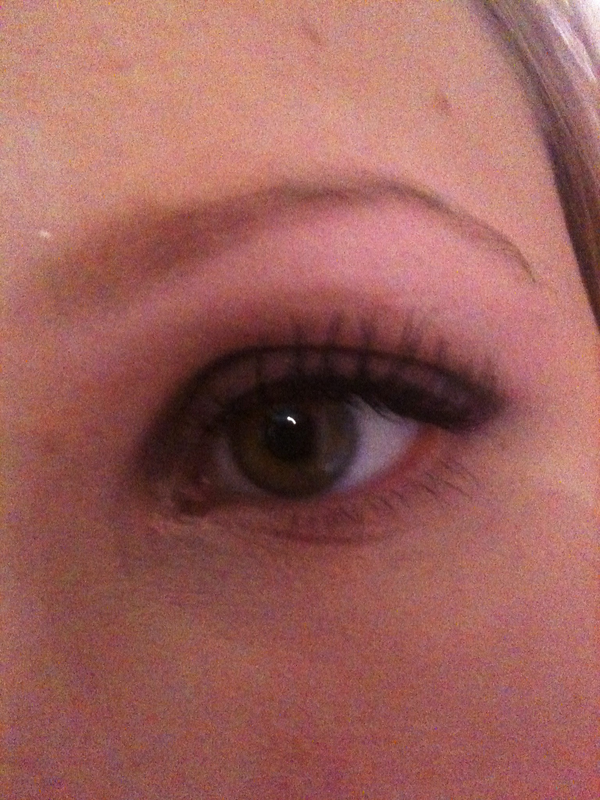 Then squeeze the end of the applicator to release the lashes and they should be perfectly in place! 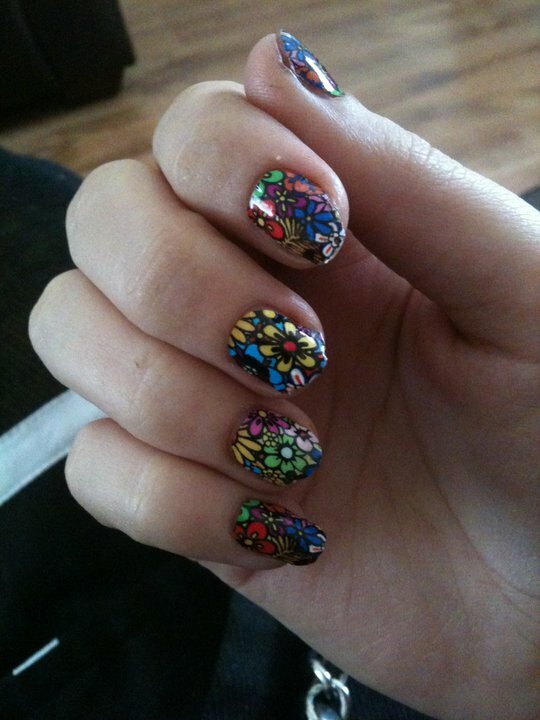 You can use your finger to gently press on them to make sure they're on securely. You can curl or whatever then if you want to blend more. 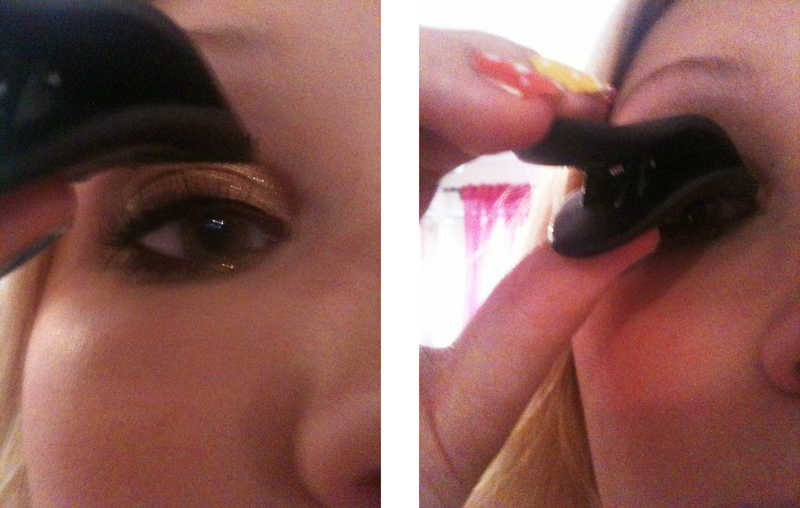 Honestly, using the eyelash applicator means it takes me about five minutes to do my false eyelashes and I'm good to go. I highly recommend them, and the one I have from ELF is part of a set that includes the applicator, the clear glue, the thickest eyelashes pictured above and a little eyelash stand for only £3.50, available here. Hellooo. Yesterday me and two of my best friends felt like a catch up (even though we see each other at least once a week!) and decided to go for lunch and drinks. Now, baring in mind me and one of my friends, let's call her Ben - because that is actually what we call her - are unemployed, we wanted to to be a reasonaly cheap day/evening. We settled on November Cafe in Glasgow for lunch and a couple of cocktails to start. 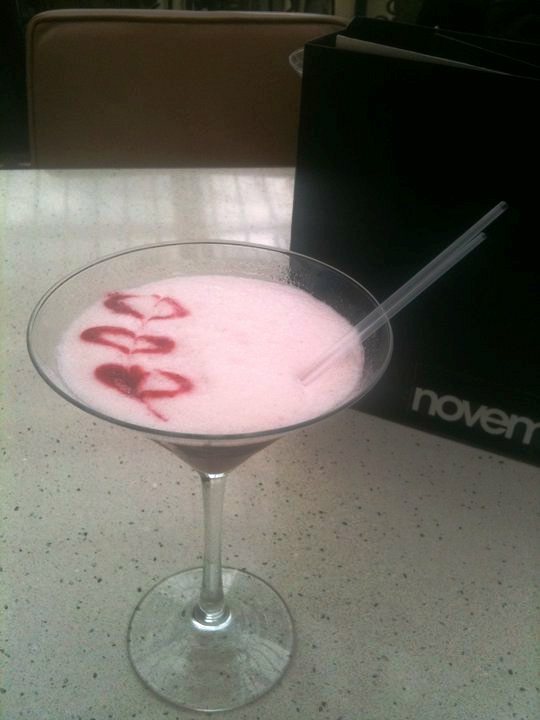 ... it was off to Wetherspoons lol. We don't really frequent Wetherspoons that often but I'd seen an advertisement of cocktail pitchers for a fiver. A fiver?! SOLD. But when we got there, it was suddenly two for £14..? Hmm. So we got four pitchers and whiled away a few hours chatting! Lovely. So what did I wear? Well, it was cold and wintery, so I decided to play on that and dusted off my white tights. Now I know they're not everyone's cup of tea; they're not overly flattering, they really stand out and they can make you look about six, but I love them! Sorry the pictures, again, are poor quality. For some reason I thought it would be a fantastic idea to wait until I got home to take the photos, and it probably wasn't my best plan ever. So they're a bit blurry as I the camera was struggling to focus, and the lighting is all wack because it was nighttime so I had to put on my spotlight on my ceiling which cause crazy shadows. But! Anyways. What do you think about white tights? Have you worn them before? If not, is it a look you'd try? Let me know! I hate my eyebrows. They are a horrible shape, are blonde, and just don't look like all the celebrities' do. My sister started plucking them for me when I was about sixteen or seventeen, but I could never keep it up myself and she'd always dispair when she had to start from scratch every time. When she moved out, I either had to face having unruly brows, or do something about it. I decided to try waxing. I don't mind getting my eyebrows waxed, sure it stings and makes my eyes water like crazy woah, but it looks ok and lasts ok. 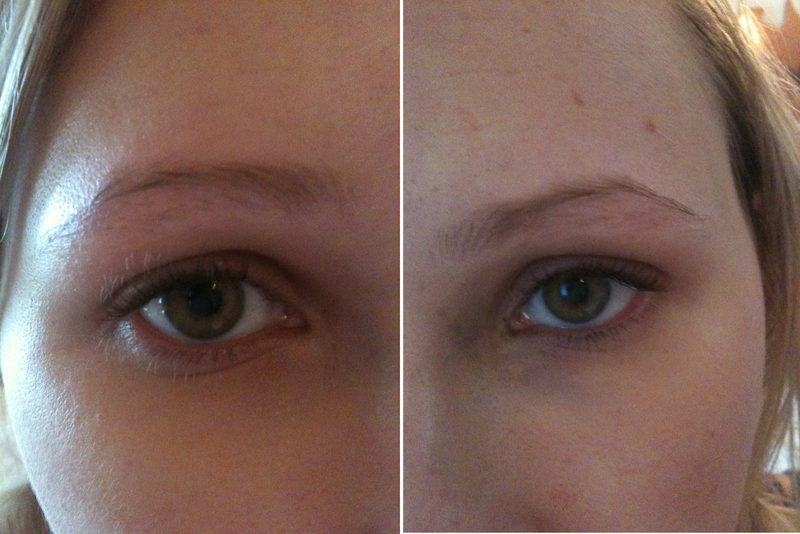 But when threading became more widely available, I decided to give it a try. It's basically a Middle Eastern technique where the technician uses strands of thread twisted together to pull out the hairs as they catch between the threads. Not gonna lie; it hurts! 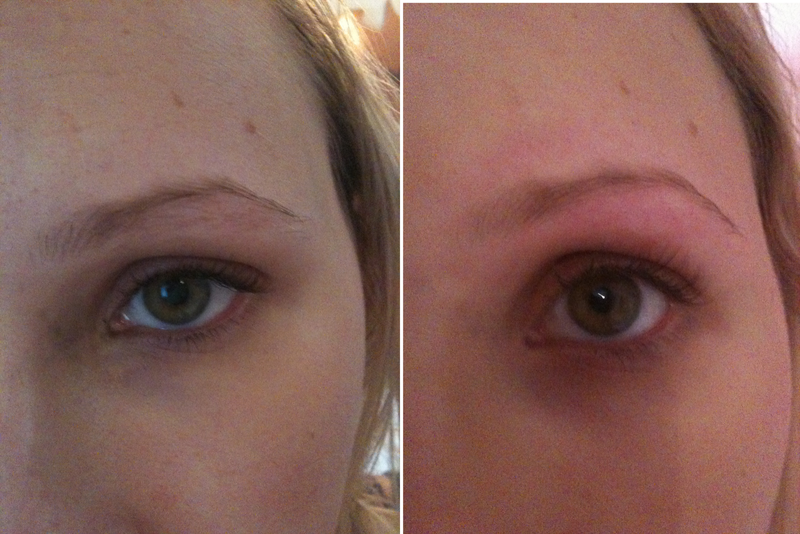 But overall I feel the benefits of threading win, so here's some photographic evidence. 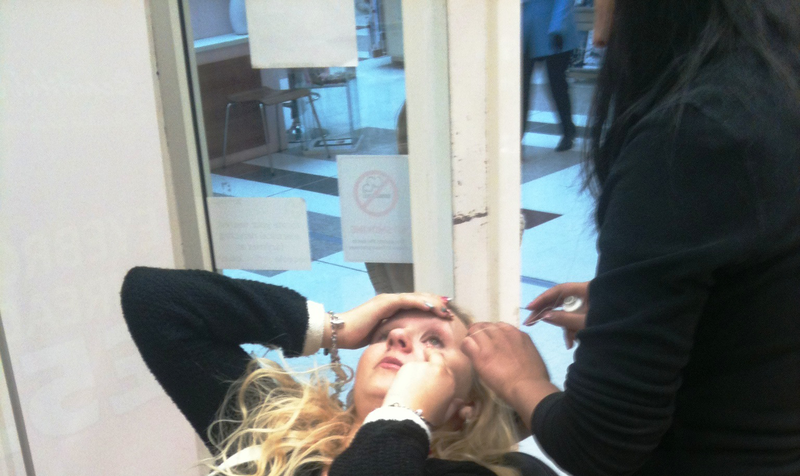 Please bare in mind I have no make up on cause my eyes always water so there was no point!! Very furry and ugh. 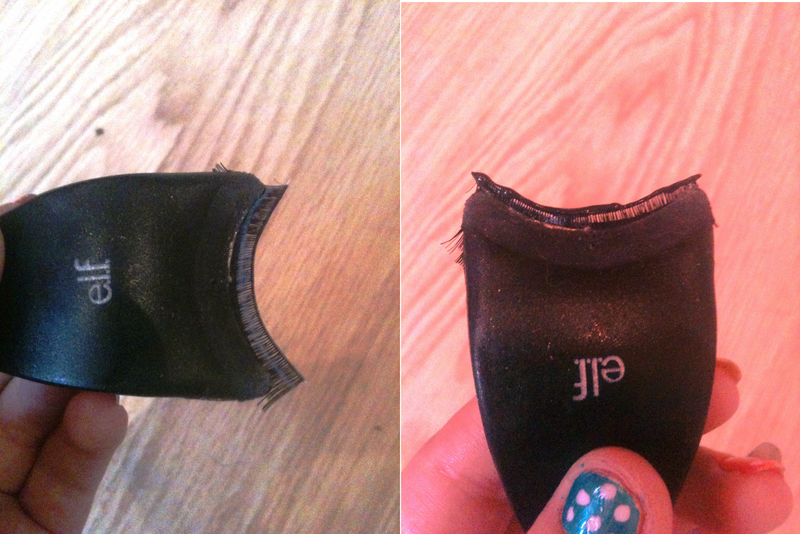 You can see I'm a bit pants at the whole tweezing/tidying thing. Can you believe I went out like this?? Check out the double chin lol!! 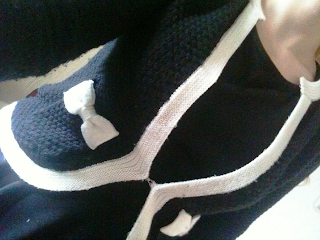 This is where I was having to hold the skin taut to make sure the shape stays neat and tidy. I know my eyebrows seem slightly different shapes, the girl that did my eyebrows today was a new start, but tbh they don't look uneven in real life so I'm happy with them! 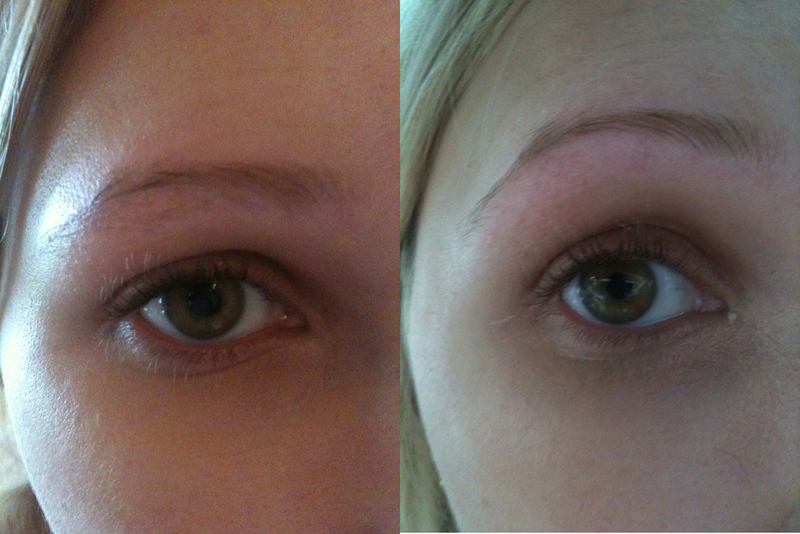 What do you think, have you tried threading before? Are you thinking of trying it? Let me know! Ok, first off, before I ever start this post, I just want to apologise whole-heartedly for the photos in this post. My camera died and I was in a rush, so I took some quickies with my phone and didn't bother looking at them until oh, five minutes ago. And they are pants. Poor quality, poor lighting, and like a big stupid I took the photo in the mirror so you can see my phone taking the pics. DUH. Soooo, anyways...! Today I was kidnapped gently persuaded by my boyfriend Scott to attend a Graduate Fair with him. He's in his honours year at uni, and I'm an unemployed graduate, so it all seemed like a logical thing to do. 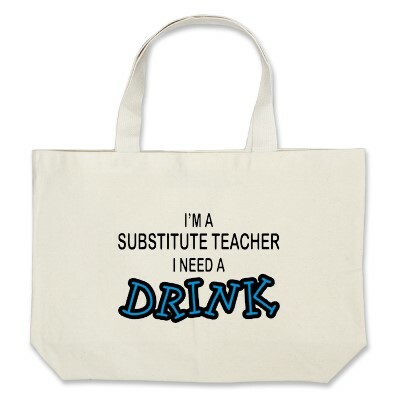 Except I'm a teacher, and every single stand had to do with busines degrees. Meh. .. so it was like a midget pushing a giant around saying 'This is Scott! He wants to know more about your graduate scheme!!" and then jumping in the convo with my notepad at the ready and my pen tapping my chin, "soo, what is the chance of progression in your company? How many grauduates are you taking on?? What are you looking for in an employeeeeee???" All the while poor Scott stands there looking bemused. Needless to say, I didn't get offered any fantastic jobs, so I'm back to claiming jobseekers today, YIPPEE. So let's get these horrendous photos out the way. 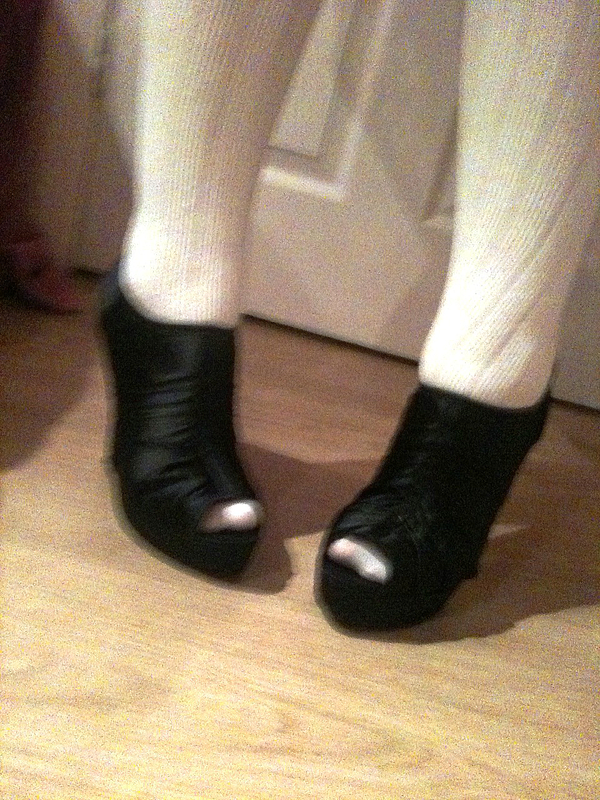 I thought I'd go smart, but with a quirky twist of the knee high socks. 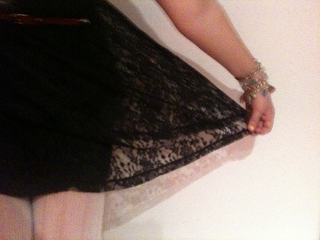 I am a bit of a Primark whore, just realised the whole outfit came from there. It's a little skater dress with gold buttons on little fake pockets, I just love skater dresses, I think they are so flattering for my figure. I love the cardigan too, got it last year and it's a bit Chanelesque. =p Over the knee socks are my winter staple right now, so I had to throw them in with a wee pair of sensible shoes. As it turns out, all my effort (ha) wasn't worth it but hey, it was worth a try! Going to get my eyebrows threaded later today so if you've never had it done and are curious about it, make sure you check back tomorrow for my threading post! Hopefully The Firminator will become my new hero!! 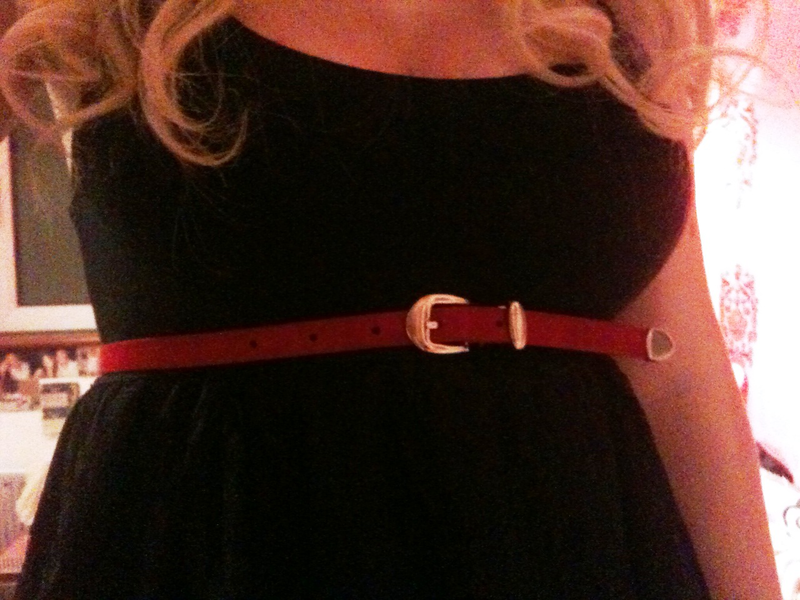 The past couple of weeks, I've started to realise if I want to lose weight/ tone up, I gotta do something about it! I've started going to Zumba between 4-6 times a week which I LOVE, and Thai Boxing once a week. I'm trrrrying to eat healthy, but I'm just not very good at it! So, on my last (dangerous) journey to Boots, I meandered over to the Soap & Glory section and saw it was on 3 for 2 (veeery dangerous). 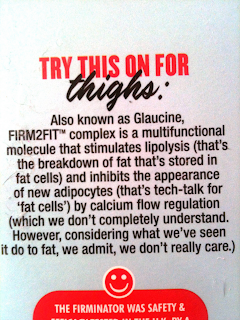 After quickly checking the Boots website for reviews, I decided to buy The Firminator Body Contouring Gel. Soooo... no idea what most of that means. But the general idea is you massage it into areas that need firmed up twice a day, and after 56 days (roughly 2 months), you should be all nice and toned!! I'm a liiiiittle bit sceptical, but two months takes me up to about Christmas so I'm going to give it a go. 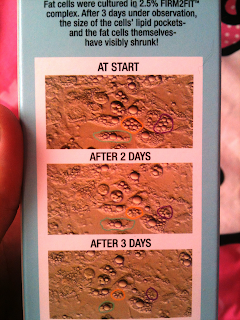 It says it works better alongside exercise, so that's good. A cool feeling gel that once you've rubbed in all the areas you want to tone up, starts to tingle a bit so it does feel like it's doing something! It's quite pricey at £10.21 as reviews say you go through bottles quickly, but with 3 for 2 deals usually on it works out a bit better. 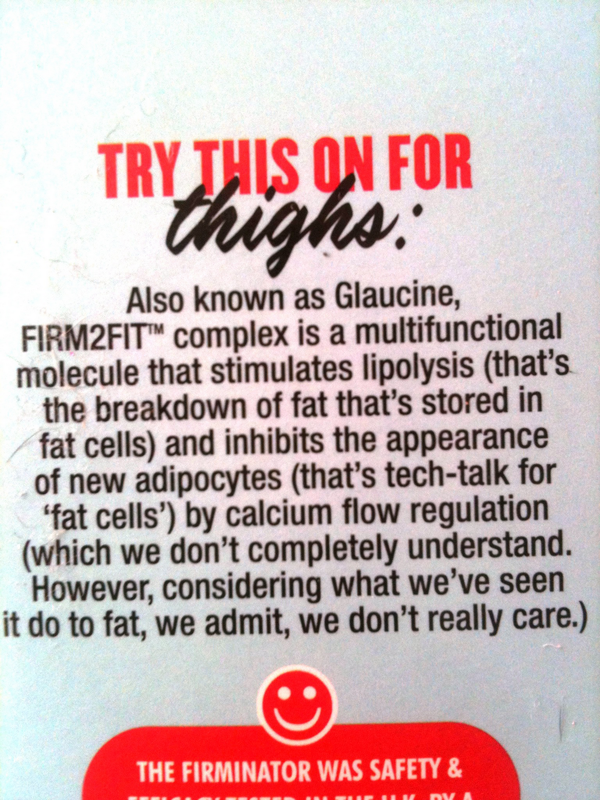 I'm going to try it on my thighs, tummy and upper arms. I'll let you know how I get on! These are my 'city lights' falsies, don't know why I picked such big nails!! I thought I'd do something a bit more simplistic, just a monchrome look with a colour pop. 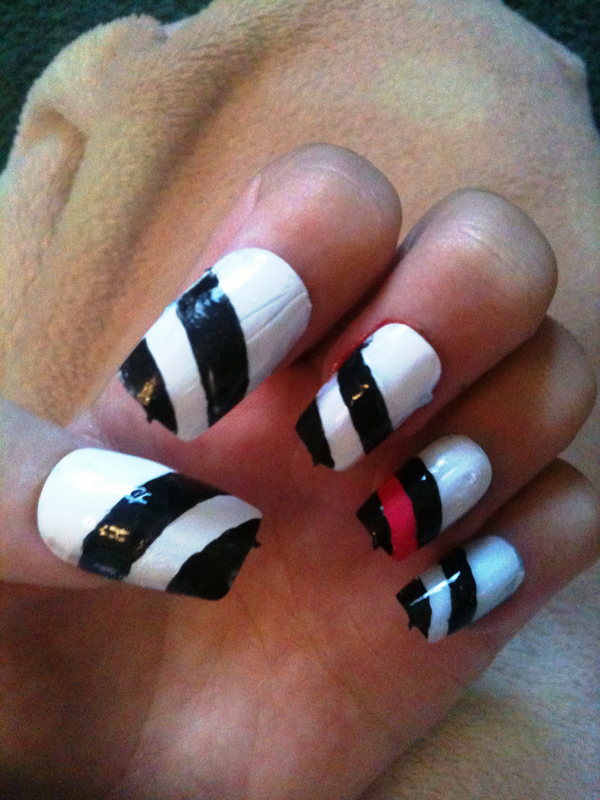 I didn't have any tape to do straight lines so they're a bit wobbly!! 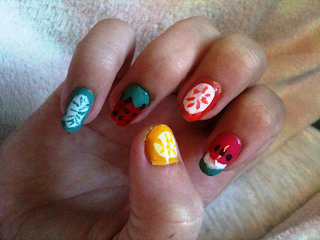 Took my Shellac off and tried some fruit on my nails... a lime, strawberry, orange, watermelon and lemon! So, in the past oh, ten years, I've been in a constant battle to quit biting my nails. 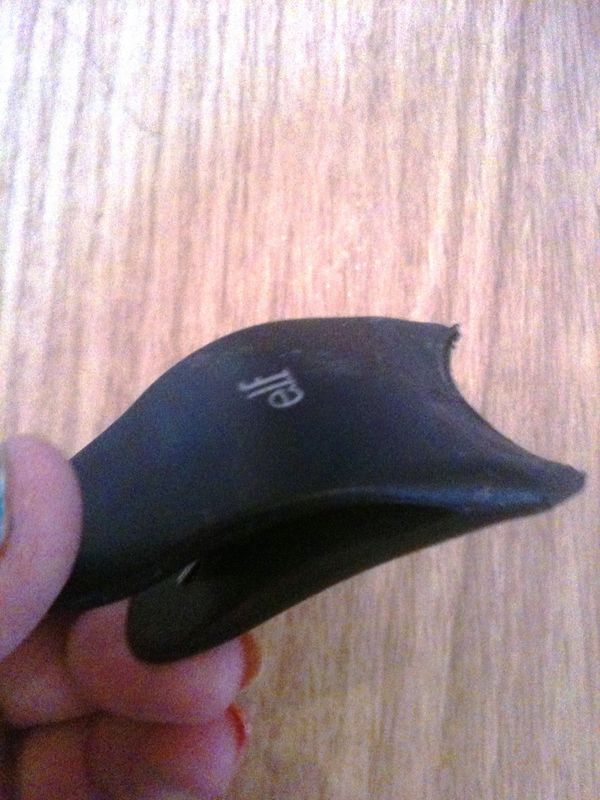 Sometimes I've managed really well, stopped biting for like six months, but I always fall back into the horrible habit. I'm in a kind of in-betweeny stage just now, my nails have grown a lot (they're miniscule when I'm in Bite Mode) but I'm still nibbling the sides of them. 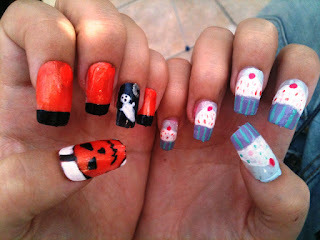 The thing is, I LOVE having long nails! 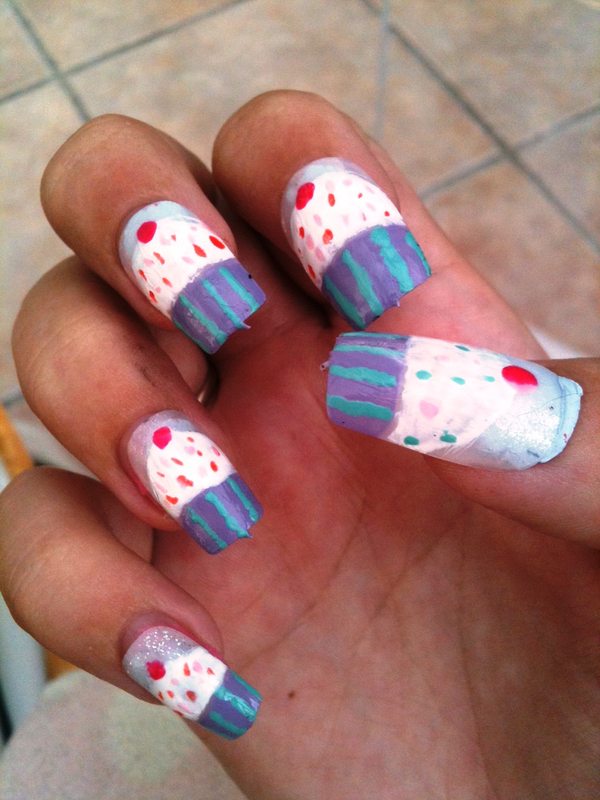 I love to paint them and look and them and tap-tap-tap them on anything that stays still for more than three seconds! So to help me grow my nails, I tend to paint them a different colour every day or do cute wee patterns to make me not wanna bite them and ruin the pattern! I discovered Minx about two years ago, when my sister first got them done and I could only look down at my own little stumps in dispair. 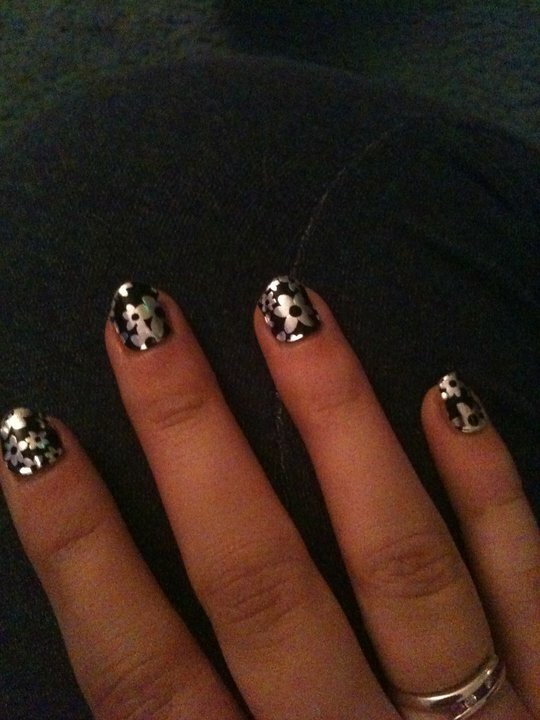 So as soon as I'd grown my nails long enough, Minx were my addiction! I buy them off eBay and do them myself, and when I ran out of money to fuel this addiction I switched to generic types (3 packs of foils for fiver?!). Real Minx (above), fake Minx (below). Then, when my sister bought a Shellac kit and did this for me, I was also hooked! I liked my nails so much that I didn't wanna bite! Howeeever... even Shellac is starting to wear off on me now (or maybe I just need some new colours!). So I'm on to nail art. So we have (L-R) a snow scene, a snowman, a present, a Christmas tree, and general Christmassy colours. 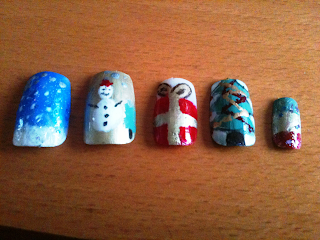 I don't have any nail art tools eg a nail pen, so it wasn't the easiest of tasks but I think they turned out quite cute! 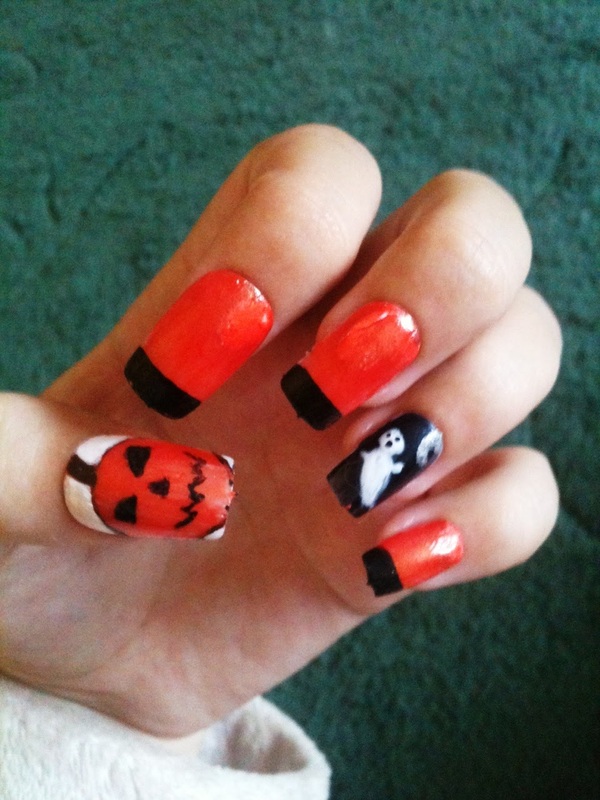 My next thought was that maybe I should concentrate on something a little closer, so here are my Hallowe'en nails! 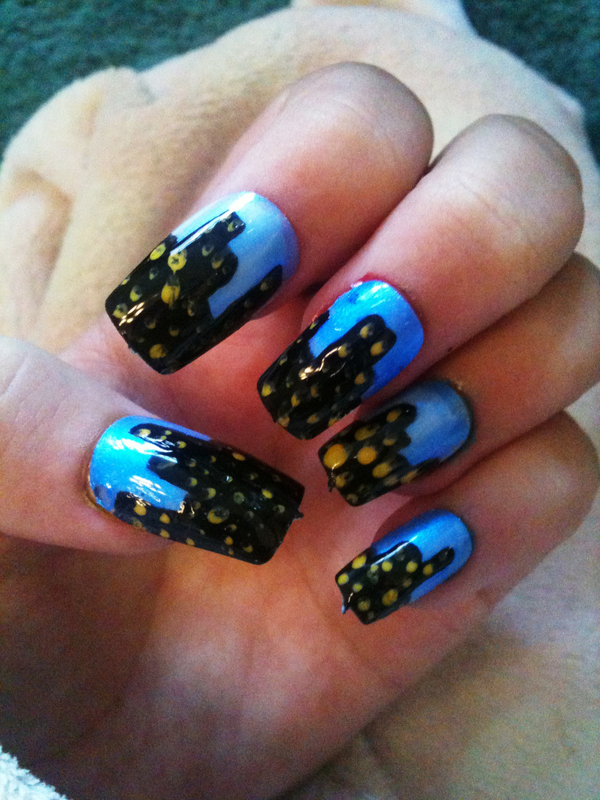 This time I blu-tacked them onto my nails to get a better effect. A scary pumpkin and a little ghosty! I stupidly didn't let them dry fully when I stuck them on my fingers, hence the smudges where I've pushed down on sticky polish. Then, and by this point my family were starting to worry for my sanity, I decided to work on a season-free design. I settled on some cute cupcakes. They look a bit odd with the blu-tak sticking them on cause they were glittery clear at the cuticles but have a blue-ish tinge because of how they've been stuck on. So here's my finished hands! What do you think?? Hopefully when I take off my Shellac sometime in the next week I can do some designs on my nails for real!